This schematic illustrates the informatics-based adaptive design strategy. Image: Los Alamos National Laboratory. Researchers from the US and China have recently demonstrated how an informatics-based adaptive design strategy, tightly coupled to experiments, can accelerate the discovery of new materials with targeted properties. They describe their novel strategy in a recent paper in Nature Communications. "What we've done is show that, starting with a relatively small data set of well-controlled experiments, it is possible to iteratively guide subsequent experiments toward finding the material with the desired target," said Turab Lookman, a physicist and materials scientist in the Physics of Condensed Matter and Complex Systems group at Los Alamos National Laboratory. Lookman is the principal investigator of the research project. "Finding new materials has traditionally been guided by intuition and trial and error," said Lookman. "But with increasing chemical complexity, the combination possibilities become too large for trial-and-error approaches to be practical." To address this issue, Lookman, along with his colleagues at Los Alamos and the State Key Laboratory for Mechanical Behavior of Materials in China, have successfully employed machine learning to speed up the material-discovery process. 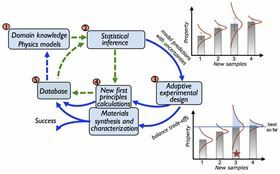 The researchers developed a framework that uses uncertainties to iteratively guide the next experiments to be performed and used it to search for a shape-memory alloy with very low thermal hysteresis (or dissipation). Such alloys are critical for improving fatigue life in engineering applications. "The goal is to cut in half the time and cost of bringing materials to market," said Lookman. "What we have demonstrated is a data-driven framework built on the foundations of machine learning and design that can lead to discovering new materials with targeted properties much faster than before." The work made use of Los Alamos' high-performance supercomputing resources. Although the Materials Genome initiative, introduced by the White House Office of Science and Technology Policy in 2011, spurred interest in accelerated materials discovery, this study is one of the first to demonstrate how an informatics framework can actually lead to the discovery of new materials. Much of the effort in the field has so far centered on generating and screening databases typically formed by running thousands of quantum mechanical calculations. However, the interplay of structural, chemical and microstructural degrees of freedom introduces enormous complexity. This is particularly the case if defects, solid solutions, non-stoichiometry and multi-component compounds are involved, as current state-of-the-art tools are not yet designed to handle these factors. Moreover, few studies include any feedback to experiments or incorporate uncertainties. Lookman and his colleagues focused on nickel-titanium-based shape-memory alloys, but their strategy can be used for any material class (polymers, ceramics or nanomaterials) or target properties (e.g. dielectric response, piezoelectric coefficients and band gaps). This becomes important when experiments or calculations are costly and time-consuming. What is more, although the work focused on the chemical exploration space, it can be readily adapted to optimize processing conditions when there are many ‘tuning knobs’ controlling a figure of merit, as in advanced manufacturing applications. Similarly, it can be generalized to optimize multiple properties; in the case of the nickel-titanium-based alloy, these properties included low dissipation and a transition temperature several degrees above room temperature. This story is adapted from material from the Los Alamos National Laboratory, with editorial changes made by Materials Today. The views expressed in this article do not necessarily represent those of Elsevier. Link to original source.